Growing mushrooms is not an earth shattering event for we have been eating mushrooms for centuries – or so I have been told. But YWCA Chairwoman Praichit Jetpai was introduced to the idea of ‘mushroom farms’ and, being a lady to seize every opportunity to help those in need, the seed of an idea developed to help schools not only to grow mushrooms, but to grow them in such quantities that they are able to provide fresh vegetables to the children at lunchtime and to offer the surplus to the families of the children at a cheaper price than they could buy them at the local market. The children have vegetables picked that day, the families benefit and they will accumulate sufficient funds to replenish the mushroom spoors. More than 20 local schools, with the help of Pattaya Sports Club, Rotary and Jesters Care for Kids, have taken advantage of this initiative. Mayor Itthiphol Kunplome and guests open the mushroom farm. But where to go from here? 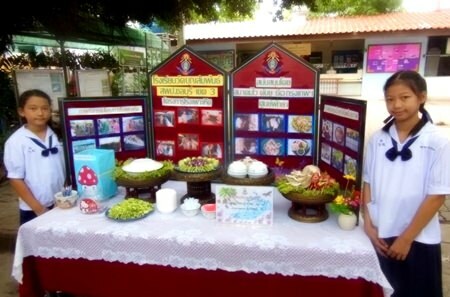 Inspired by the philosophy of His Majesty the King’s “sufficient economy”, with the help of Pattaya City Hall, and those mentioned above, a Mushroom Learning Centre has been established at School No. 7 to be a centre of learning to teach schools, various centres and the general public how to look after and develop mushroom farms and turn this into a thriving cottage business. Young Thai dancers entertain the guests. A professor from the Chandrakasem Rajabhat University Business Centre will visit every month to help those attending to develop mushroom farms to provide additional income with information on how to sell the product to hotels, markets, restaurants, etc., and how to grow many varieties of mushrooms. The centre was opened on the 5th June with many guests in attendance, including the Mayor Itthiphol Kunplome, to formally open the centre. Many stalls had been set up to show the versatility of mushrooms. Most of us thought mushrooms were only for eating but Thais take advantage of everything that surrounds their everyday lives, and we witnessed mushroom drinks, skin creams and other products with mushrooms as the base ingredient. 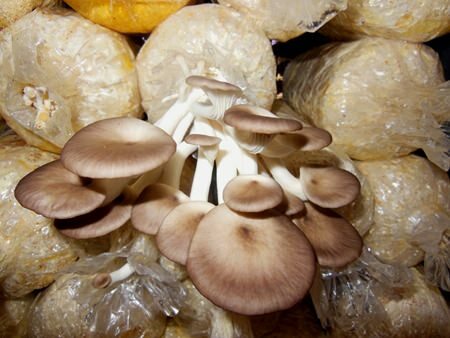 It is amazing how quickly the mushrooms grow with so little effort and one thing is certain, this is a scheme that will develop very quickly for the benefit of many people. YWCA Chairwoman Praichit Jetpai talks about how she was introduced to the idea of ‘mushroom farms’. 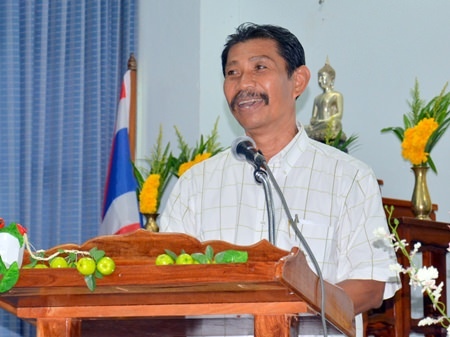 Manas Khongwattana, principal of Pattaya School No. 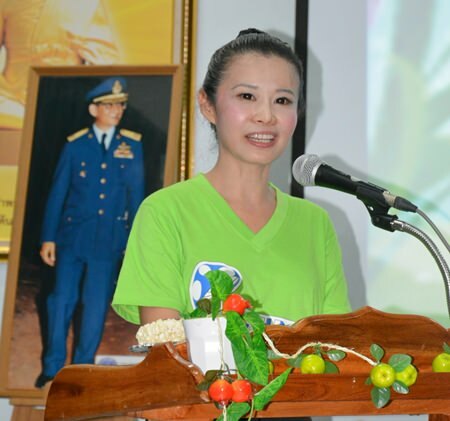 7 (Ban Nongphangkhae), speaks about how this project is helping to build the hopes of youths. Mushroom spoors are in place. The mushrooms grow very quickly. 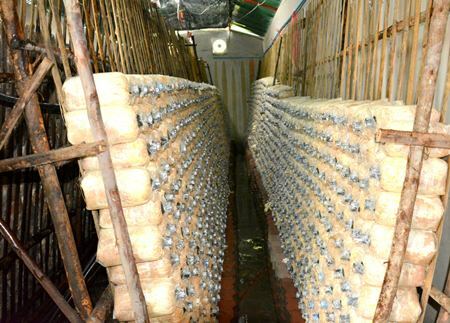 Young women display some of the things that can be made from mushrooms, including mushroom drinks, skin creams and other products with mushrooms as the base ingredient. 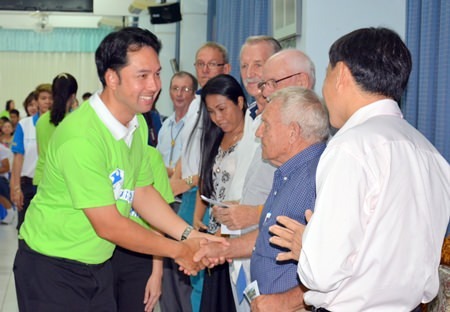 Mayor Itthiphol Kunplome shakes Bernie Tuppin’s hand, thanking him and other PSC Charity members for their support. Many students are invited to see what is happening. Members of the YWCA and Pattaya Sports Club pose with students and teachers in front of one of the many farms.